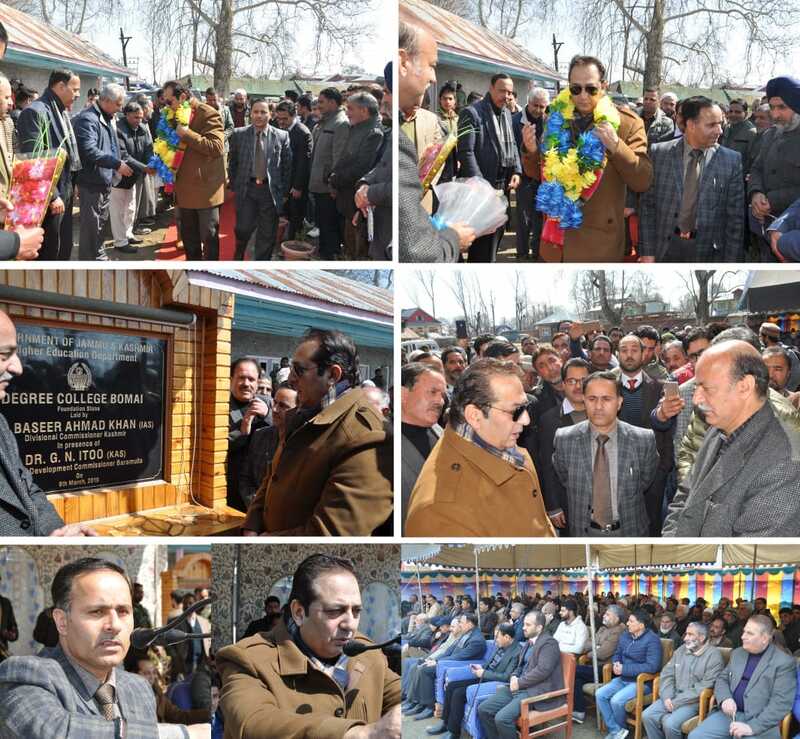 Baramulla, 09 March: Divisional Commissioner Kashmir, Baseer Ahmad Khan in presence of District Development Commissioner Baramulla, Dr G N Itoo today laid foundation stone of Government Degree Colleges Bomai, Sopore which will be constructed at an estimated cost of Rs 10.75 crore. Appreciating the government decision of establishing the College, the people expressed gratitude towards the governor administration for resolving their long pending demand. The college was the persistent demand of the people which will cater to the higher educational needs of Bomai and Zaingeer area. Addressing a huge gathering of people, Divisional Commissioner said the work on the college shall be started shortly so that academic work can be started as early as people. He said that Governor’s administration has already initiated several measures for strengthening the educational infrastructure in the State, so that people living in rural and far-flung areas get quality educational facilities within their catchment areas. Complementing the people of the area, Baseer Khan sought cooperation from general public in projecting developmental and other issues besides assuring for fulfilling the basic requirements of the area. He further informed that the work on the renovation of historical shrine at Tujjar Sharief shall be started shortly adding that issue has been taken with the concerned authorities. Meanwhile, the Divisional Commissioner directed for developing sports infrastructure under the centrally sponsored ‘Khelo India’ sports initiative. District Development Commissioner Baramulla Dr G N Itoo during his address, said that every possible effort will be made to develop this educational institution at par with other degree colleges of the district. He said that this institution will be a milestone in further strengthening the higher education status of the area besides reiterating government’s commitment of strengthening and streamlining education system. ADC Sopore, principals of various colleges, SE R&B, SE PHE District and sectoral officers, and others concerned were present on the ocassion.